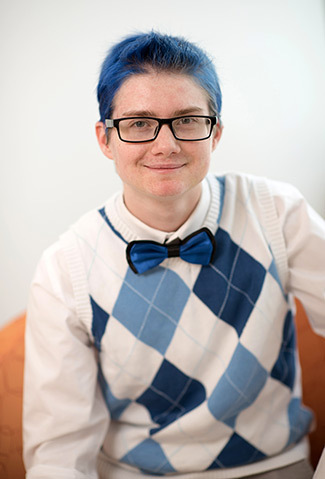 The Biology and Social Policy major and transgender activist has sought to improve accom­modations for transgender students and create a more welcoming atmosphere on campus. Adam Davies is on a mission. Since enrolling at Northwestern two years ago, the transgender man has emerged as a vocal advocate for transgender student rights. Working with organizations such as Rainbow Alliance and the Associated Student Government, Davies has sought to improve accommodations for transgender students and create a more welcoming atmosphere on campus. Davies sat down with Weinberg magazine to talk about his work with the Northwestern transgender community. How many transgender students are enrolled at Northwestern? Well, there are those we know, and those who haven’t come out yet. I know upwards of about 30 transgender individuals at Northwestern, but we might estimate that there are 45 to 60 just by using basic Illinois population data. What accounts for that gap? A lot of people have yet to come out because they fear hardships on campus. There’s also the very real fear that they could lose their parents’ support if they do come out. What are the top campus issues for transgender students? The first is bathroom accessibility and the need for all-gender bathrooms across campus. The second is raising awareness around pronoun understanding. And the third concerns campus medical and psychological services. It’s not a conscious decision by someone that these things won’t be provided, but rather a reflection of the fact that the system was not set up for students like me. Why are these needs so important? These issues can create huge difficulties for transgender students [nationwide], 38 percent of whom drop out due to the disadvantages that they face on their college campus. The failure to prioritize pronoun usage, for instance, is a small part of the greater issue of transgender student erasure, which can cause stress and discomfort to students. How would you describe the response of the Northwestern community to your activism? In many ways, Northwestern is a progressive university. That said, there are still some people who don’t think transgender students should have the same basic rights as all other students, or who believe that we are such a small minority that our particular needs aren’t terribly important. I would argue that Northwestern has the tools to create a more inclusive environment and become a leader in the market. In what ways are your studies contributing to your on-campus activism?